Ivy Itch ReLeaf FOR EXTERNAL USE ONLY. Soothes plant contact irritation in sensitive individuals. 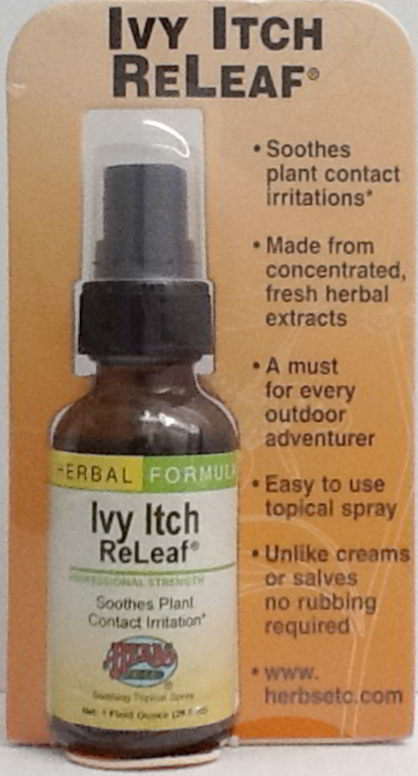 Useful for poison ivy, poison oak, poison sumac, stinging nettle and mullein skin irritations. Unlike creams or salves no rubbing required, just spray. Suggested Use: Spray liberally on affected areas from three times a day or up to every two hours. Let dry. Ingredients: Fresh Jewel Weed herb, fresh Grindelia flower, fresh Plantain leaf, Licorice root and Echinacea angustifolia root. Warning: Discontinue use and consult with a doctor if condition persists, worsens or an infection occurs.